Ucluelet sits on the west coast of Vancouver Island in an outdoor person’s paradise. Ucluelet has a rich history and is one of the most beautiful spots to visit in Canada. Once you visit this beautiful part of Canada, you will most likely come back. Many people visit once and then find themselves coming back to enjoy and laid back west coast lifestyle along with all the rugged beauty that rainforest on the ocean provides. 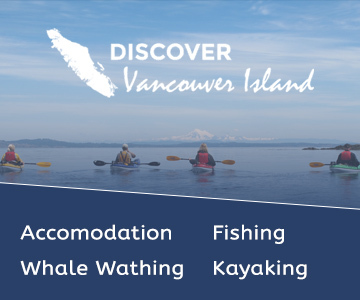 There is lots to do here including some of the world’s best ocean salmon fishing, incredible hiking, whale watching, kayaking, surfing and more. Ucluelet has many great restaurants and services to make your stay comfortable, but Ucluelet also has many little walks and beaches that are passed up by people visiting. It is worth making time to visit the many beaches and take in the crashing surf along with the uncrowded beaches. Please check out the directory of services as well as the blog for many tips about the area. Ucluelet is a popular area for surfing year round, but also is great for storm watching, rugged nature and its many beaches. Pacific Rim National Park is one of the favorite vacation spots along the west coast of British Columbia. There are three regions: Long Beach, The Broken Group, and the West Coast Trail. The park is well known for its lush forests and rugged coastline. Click on our blog for more information on Pacific Rim National park, hiking trails and interesting things to do that don’t require guide services. Tofino is 30 mins north of Ucluelet and you can check out www.tofino-info.com for information for activities here. 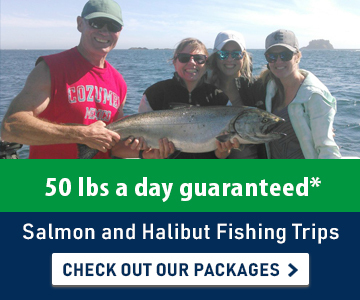 Ucluelet has incredible Salmon and Halibut fishing. Discover surfing and surf shops close to Ucluelet. Try Kayaking the Broken Group. Simply amazing. Whale watching is less crowded in Ucluelet. 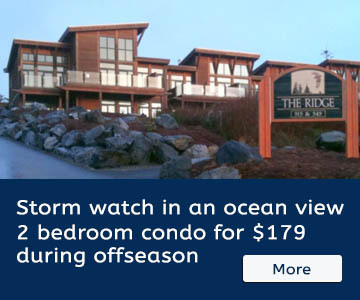 Ucluelet has some great resorts both on the inlet and open ocean. Ucluelet BC sits at the south end of a peninsula and is about 35 mins south of the town of Tofino. Ucluelet historically was known as a commercial fishing and logging town. Starting in the 1980’s sport fishing started taking root and by the 2000’s Ucluelet was known as a place where you could fill your tub. Ucluelet is one of the few hot spots along the west coast of Vancouver Island where fishing has stayed hot. The calmer weather and ease of access has been a big draw. But Ucluelet has much more than fishing. Ucluelet sits on the northern boundary of Barkley Sound and the Broken Group, a set of islets becoming a well know kayakers paradise. Just south of town is the Wild Pacific Trail, one of the most scenic places on Vancouver Island. Both the Wild Pacific Trail and the Broken Group have set Ucluelet on the map for its eco tourism. Ucluelet’s eco tourism has taken off and its close proximity to Pacific Rim National Park and beaches has also brought it some attention. It is the neighbors the town of Tofino, 30 minutes to the north. Ucluelet is also a quieter town which is a draw for many tourists. Tofino is known as a surfing town, but there are also surfers that have made Ucluelet their home. Ucluelet has the largest amount of feeding grounds for salmon and halibut of any area north and south. 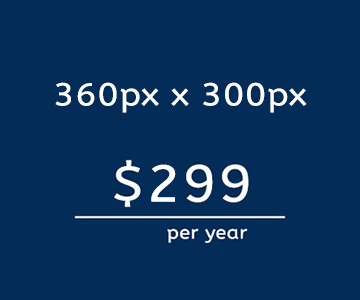 This is because it is ideally situated in the middle of many large banks. This is one of the best places in the world if you are looking for some good fishing. Salt water sea kayaking is also a huge draw to Ucluelet. The Broken and Deer group islets have become popular areas for kayakers. Here you can go on half day or full day trip with lunch on a private sandy beach. You can also go on a day cruise in Barkley Sound to view wildlife and the natural beauty of the area. About 15 minutes north of Ucluelet is the infamous Pacific Rim National Park. For years, it has been a favourite vacation spot along the west coast of British Columbia. It’s loved for its three distinct regions: the Broken Group, Long Beach, and the West Coast Trail, which hug the rugged coastline and contain lush, coastal rainforest. Today, the national park’s appearance is a far cry from when it was first cleaned up. Ask any of the area’s older residents and they’ll tell tales of days past when people used to camp, live and even drive their cars along the stretches of sandy beach. @discoverucluelet for pictures we should repost! Every March, Ucluelet and Tofino team up to celebrate the 20,000 Gray whales that pass by the coast during their migration. Every other year, a point-to-point sailboat race that circumnavigates Vancouver Island takes place in June. A marathon along the coast, racers head from Tofino and along the Wild Pacific Trail to finish at the Village Green in Ucluelet. Pacific Rim Whale Festival. Every March, Tofino and Ucluelet team up to celebrate the 20,000 Gray whales that pass by the coast during their migration. Tofino Shorebird Festival. Thousands of birds migrating north along the coast are celebrated on the last weekend of April. Although most come to Ucluelet and Tofino for sunshine and beach time, the offseason can be just as exciting. November brings the winter storm season with it, and up until February or March, BC Locals and visitors alike flock to the shores to check out the action. Impressive gusts of wind up to 70km an hour create massive, 15ft waves that smash into the rocky coastline. Storm watching is a favourite winter pastime to see Mother Nature put on a powerful show. The best wave hotspots include the Ucluelet Blowhole, the Amphitrite Lighthouse, Long Beach and Chestermans Beach.